We’ve said it before and we’ll say it again, the great thing about eating and preparing fish is the simplicity of it all, plus it bakes up quickly, leaving you to do more important things around your home. You can even catch up on a chapter of your favorite book while your lovely salmon fillets are baking to their excellence in the hot oven. A glass of full-bodied wine is optional for the modern Paleo person, though if you have any doubt, go with the theme of “when life gives you lemons…” and make a fresh lemonade to quench your thirst while waiting. It is not a long wait, so better act quick! 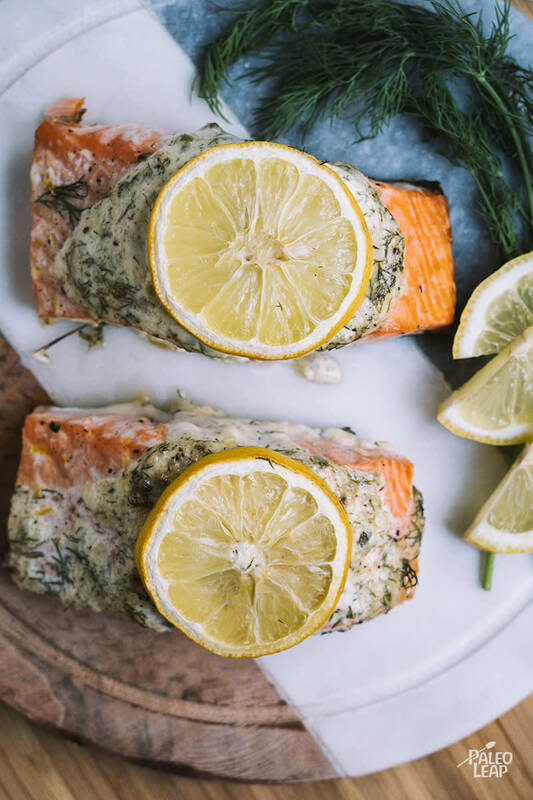 Salmon is an amazingly tasteful fish to be sure, but let’s be honest, you are really here for the lemon-dill sauce. It is made with homemade mayonnaise, and you really need to be making it all on your own, and you will never look at store-bought mayo the same way again. It is that good. The unintentional added benefit of making this salmon dish, is that it will make you feel like an accomplished cook – it looks amazing and it is restaurant quality that will impress your guests just as much as you. So go ahead and bake that fresh salmon, feel free to gloat (just a little) and lap up that lemony-dill sauce as politely as you can. In a bowl combine all the ingredients for the dill sauce, season to taste and whisk until well emulsified. Refrigerate until ready to use. In a small bowl mix the lemon zest, lemon juice, olive oil, and season to taste. Place the salmon fillets in a baking dish, and drizzle with the olive oil-lemon juice mixture. Spoon 1 tbsp. of dill sauce over each salmon fillet, and top with a fresh slice of lemon. Place in the oven and bake, 15 to 20 minutes, or until the fish flakes with a fork. Serve the fillets with the remaining dill sauce, and extra lemon slices.